The local Board of Advice recommended that a new school be built after the school known as Gum Creek was blown down in November 1876. Gum Creek was about 1 mile W of the later school site. For a time a residence was used as a school. The Dwyer's Creek School, situated 6 miles NW of Merino, where Dwyer's Creek crosses the Merino-Casterton Rd, was opened 1st of January 1878. It was on land purchased from F. HENTY, about 1 mile from the historic "Merino Downs" homestead. The school 36ftx18ft had four rooms attached as a residence. The first HT was Robert WALLIS (1st of January 1878 - 18th of September 1883). The school was controlled by the Board of Advice for South Riding for the Shire of Glenelg, officials being: President - James ANDISON, Correspondent - FORD. The name HENTY was given to the railway station, which opened in 1882. For some years the Board of Advice opposed a change of name for the school, and it was not until 3rd of May 1894 that the name HENTY was accepted. The school was part-time with Tahara West 1912-16. Still marking HENTY school site is a memorial to Major MITCHELL, erected by scholars and HT J. SEXTON, and unveiled by Sir Alexander PEACOCK, Minister of Education, in August 1927. The HENTY school was included in the consolidation scheme at Merino. The last Henty teacher was Keith McALPINE. The school closed on 6th of September 1949. 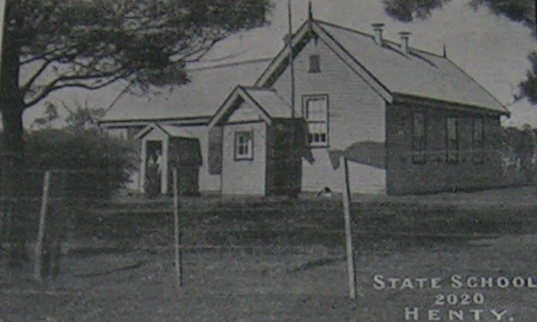 The existing pupils then attended Sandford and Muntham schools until the Henty bus from Merino Consolidated School began its service on 19th of September 1952. The school room was moved to become the kitchen at Merino Consolidated School; the residence also placed in the M.C.S. grounds, and after additions and repairs, became a residence. The school site, still supporting trees planted by early pupils, is owned by the Department and leased to E. SIMS. The Henty State School No.2020 Honour Roll was unveiled on 2nd December, 1922 by Mr. Fred WALLIS the first teacher at Henty State School 2020 from 1878 to 1883. The current Head Teacher in 1922 was James Michael SEXTON. CAMERON, C Colin Fletcher CAMERON, b. 1881, 'Dunan' Henty, Victoria, son of Donald CAMERON and Elizabeth 'Eliza' FLETCHER. Served in WW1, Dvr 29720, 2nd Division Ammunition Column, AIF enlisted 6-5-1916, RTA 1-7-1919; Farmer "Dunan" Henty, Victoria. Colin CAMERON married Edith Muriel McLELLAN 1882-1931 in 1911 at Henty. Named on Carapook Honour Roll, Henty SS 2020 Honour Roll, Merino War Memorial. CAMERON, H Hugh CAMERON, b. 1875, 'Dunan' Henty, Victoria, son of Donald CAMERON and Elizabeth 'Eliza' FLETCHER. Served in WW1, Pte 3089 10th Battalion, AIF, enlisted 7-08-1916, KIA in 1918 at Hazebrouck, France. Living at Geraldton, Western Australia on enlistment. Hugh also served in the Boer War as Pte 1898, 3rd Battalion Australian Commonwealth Horse (Queensland Unit) and was listed as a Wool Classer of Roma, Queensland at that time. Named on Henty SS 2020 Honour Roll. CAMERON, R Robert Miles Fletcher CAMERON, b. 1877, 'Dunan' Henty, Victoria, son of Donald CAMERON and Elizabeth 'Eliza' FLETCHER. Robert was a Medical Practitioner who served in WW1 as Capt, AAMC, AIF, enlisted 1-11-1915, RTA 8-08-1916, who was living at Boulder, Western Australia on enlistment. Named on Henty SS 2020 Honour Roll. COFFEY, G George Denis COFFEY, b. 1885, Digby, Victoria, son of James COFFEY and Ann Sophia WHITAKER. Served in WW1 as Pte 6802, 48th Battalion, AIF, enlisted 6 Feb 1917, RTA ___; Bank Officer on enlistment. Named on Henty SS 2020 Honour Roll. CULL, W A William Ambrose CULL, b. at Sandford in 1894, son of John Francis CULL and Janet Sutherland TAIT. Served in WW1 as Sgt 1105, 23nd & 22nd Battalion, 1st AIF, promoted to Captain in 1916. Enlisted 7-05-1915 RTA 8-04-1918. Named on Henty SS 2020 Honour Roll. EDWARDS, R Robert Duncan 'Bob' EDWARDS, b. 1880, Merino, Victoria, son of Charles William Vickery EDWARDS and Flora McPHEE. Served in the Boer War, Pte 826 5th Vic (Mounted Rifles) Contingent. Served in WW1 with Pte 99, 4th Light Horse Regiment, ANZAC Cyclist Battalion, AIF, enlisted 21-08-1914, RTA 5-11-1917. Married Christina Jean BRUNTON in 1914. Named on Henty SS 2020 Honour Roll, Merino War Memorial. 1915 : John Andrew "Jack" FAHEY married on 2 Oct 1915 to Elizabeth "Lizzie MORIARTY at Adelaide, SA with 2 children, Dorothy (1916) & Frank (1925) born there. FAHEY, L Joseph Lawrence "Laurie" FAHEY, b. 1897, Casterton, S-W Victoria, son of John FAHEY 1858-1934 and Margaret Catherine BLACK 1857-1953. His father was with the Victorian Railways and appears to have moved to Henty between Merino & Sandford, S-W Victoria on the line to Casterton about 1892, and remained there until at least 1916. This means that most of his children, including Laurie would have attended the local Henty State School. Joseph Lawrence FAHEY married in Victoria in 1927 to Heather Belle Dingwall GORRIE and they lived at Shepparton, Victoria where at least 2 children were born. He died at Shepparton in 1962. GULL, J S Joseph Stephen GULL, b. 1889, Digby, Victoria, son of Joseph Stephen GULL and Mary Martha CAMERON. Served in WW1 as Pte 6267, 8th Battalion, AIF, enlisted 31-03-1916, RTA 30-01-1918. Named on Digby Avenue of Honour Tree 17, Henty SS 2020 Honour Roll. GULL, W A William Angus GULL, b. 1897, Digby, Victoria, son of Joseph Stephen GULL and Mary Martha CAMERON. Served in WW1 as Pte 4818, 5th & 58th Battalion, AIF, enlisted 30-07-1915, RTA 12-12-1918. Named on Digby Avenue of Honour Tree 6, Henty SS 2020 Honour Roll. HEANEY, J John Patrick HEANEY, b. 1876, Casterton, Victoria, son of Patrick HEANEY and Hanora QUINN. Served in WW1 as WO1 91, 6th, 58th Battalion, enlisted 21-08-1914, RTA ___, Accountant of Melbourne. John died in 1951 at Melbourne. Named on Henty SS 2020 Honour Roll. HORNIBROOK, H Harold John HORNIBROOK, b. 1894, Kyneton, Victoria, son of Charles Elwood HORNIBROOK and Louisa Mary LAWRENCE. Served in WW1 as Pte 6599, 27th, 50th Battalion, AIF, enlisted 24-10-1916, RTA 20-11-1918. Named on Henty SS 2020 Honour Roll. + McCABE, R Reuben Ernest McCABE, born 1895 Casterton, son of Ellen 'Nellie' McCABE who later married Francis Thomas McCAUSLAND. Served in WW1, Pte 1370, 16th Battalion, AIF, enlisted 15-12-1914, DOW ANZAC, Turkey 11-05-1915. Named on Lone Pine Memorial at ANZAC, Casterton War Memorial, Henty SS 2020 Honour Roll, Merino War Memorial, Sandford War Memorial. + McCONACHY, S Stuart Laurence McCONACHY, born 1887 Henty, Victoria, son of William James McCONACHY and Betsy 'Bessie' MILLER. Pte 933, 39th Battalion, enlisted 10 Apr 1916, killed in action, 28 Jan 1917 Armentiers, France. Named on Casterton War Memorial, Henty SS 2020 Honour Roll, Sandford War Memorial. McCORMACK, J James Albert McCORMACK, b. 1890, Sandford, Victoria, son of Thomas Francis McCORMACK and Ann MITCHELL. WW1 L/Cpl 2705, 58th Battalion, AIF, enlisted 12-05-1916, RTA 22-09-1919. + McRAE, C Charles Robert McRAE, b. 1897, Merino, Victoria, son of Norman John McRAE and Catherine EDWARDS. Pte 4153, 59th Battalion, AIF, enlisted 11-11-1915 KIA France 19-07-1916. Named on Casterton War Memorial, Henty SS 2020 Honour Roll, Merino War Memorial. RHODES, G Charles Gordon RHODES, b. 1890, Merino, Victoria, son of Charles RHODES and Elizabeth KOHN. Served in WW1, Cpl 11889, 2nd Division Ammunition Column, AIF, enlisted Hamilton 9-08-1915, RTA 29-05-1919. Named on Henty SS 2020 Honour Roll, Merino War Memorial. RICHARDS, G George RICHARDS, b. 1898, Merino, Victoria, son of George James RICHARDS and Elizabeth ELLIOTT. Served in WW1 as Pte 5099, 29th Battalion, AIF, enlisted Merino 4-10-1916, WIA Bullecourt, France, DOW 21-12-1918, Bristol Hospital, England. Named on Casterton War Memorial, Henty SS 2020 Honour Roll, Merino War Memorial. ROGERS, E Ernest Carlyle ROGERS, b. 1896, Henty, Victoria, son of Philip Atkin ROGERS and Lillias Blythe ELLIOTT. Phillip ROGERS appears to have been a teacher in the Henty, Merino area and at Wando Vale. Ernest served in WW1 as Pte 3774, 57th Battalion, AIF, enlisted 22-02-1917, RTA 22-07-1919. He married Flora Jessie COOMBS in 1920. Named on Henty SS 2020 Honour Roll. ROULSTON, J James A ROULSTON, b. 1870, Branxholme, Victoria, son of John James ROULSTON and Jane McCLINTOCK. Served in WW1, Pte 413, 13th Light Horse Regiment & 8th Battalion, AIF, enlisted 11-01-1915, RTA 3-07-1917. Named on Henty School Honour Roll, Sandford War Memorial. SALT, C C SALT, Named on Henty SS 2020 Honour Roll. SHEARWOOD, L Lawrence Matthew SHEARWOOD, b. 1890, Horsham, Victoria, son of George SHEARWOOD and Margaret Caroline GASPERINO. WW1 Pte 992, 39th Battalion and Australian Broad Gauge Railway Coy, AIF, enlisted 10-04-1916, RTA 5-03-1919. +SHEARWOOD, W William Clarence SHEARWOOD, b. 1892, Horsham, Victoria, son of George SHEARWOOD and Margaret Caroline GASPERINO. Served in WW1 as Pte 1002, 38th Battalion, AIF, enlisted 5-04-1916, KIA 4-10-1917 Ypres, Belgium. Named on Chetwynd School Honour Roll, Henty SS 2020 Honour Roll. WIDDICOMBE, W William WIDDICOMBE, b. 1866, Penshurst, Victoria, son of Francis Willis WIDDICOMBE and Caroline MARSDEN. Served in WW1 as WO1 56894, enlisted 25-05-1918, RTA 15-09-1918; Soldier prior to enlistment who lived at Warragul in Gippsland. Named on Henty SS 2020 Honour Roll.